One of the most distinctive sounds of the summer, here at Castle Beastie, is the piping cry of the oyster catchers. A pair returns here to our inland garden to breed every year, despite being birds of the seashore. They arrive without fail around Valentine’s Day (although this year they were a week later, presumably because of the harsh winter) and the first we know of their presence is usually being awoken the sound of them shrieking around the castle late on an icy February night. It is one of the punctuation marks of the seasons. Other pairs visit the lochan, but the garden pair have what may rank as the most exclusive residence in the neighbourhood. For years now, they and their predecessors (/ancestors?) 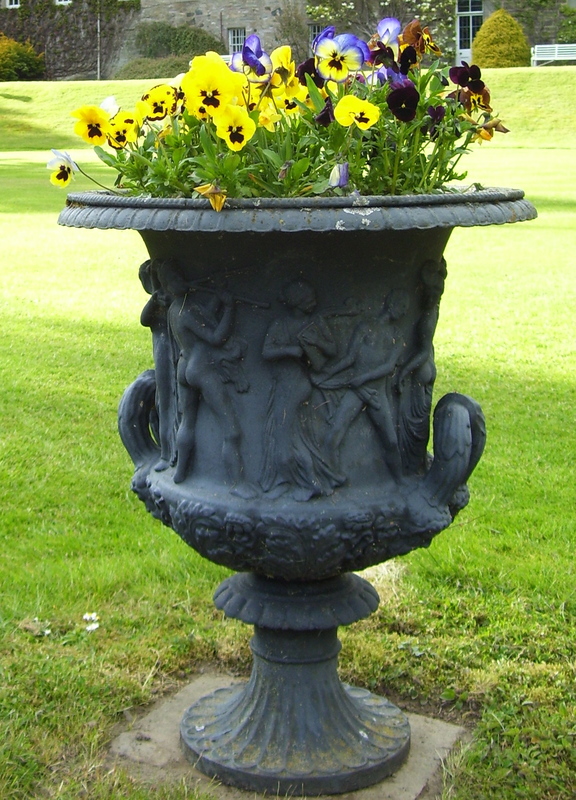 have laid their eggs in a nineteenth century, ornamental urn in the walled garden of the castle. The fun is to discover which urn they have chosen: each year they like to vary their view. At the weekend, I discovered their latest choice. 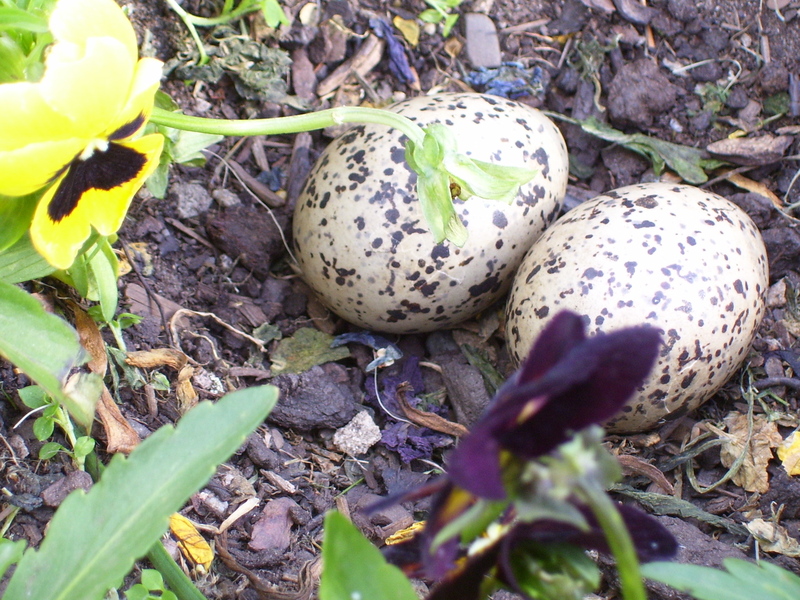 Some of the urns have recently been taken off their stone pedestals and set in to the grass, and the birds have chosen one of these in which to lay their two beautiful speckled eggs. An oyster catcher scraping out a hollow in the middle of the flowers doesn’t do the pansies much good – but it does look rather adorable. Our hard-working gardener is very forgiving of them. If you look carefully at the close-up of the eggs (photographed at the weekend), you might spot that both are cracked, bottom right. On Monday morning, when I took my youngest son to have a peek, he noticed that one of them had a little hole pecked in it. The most thrilling thing was that we could hear an occasional ‘cheep’ coming from inside the egg. I have heard this in previous years but, like any birth, each occasion is a marvel. 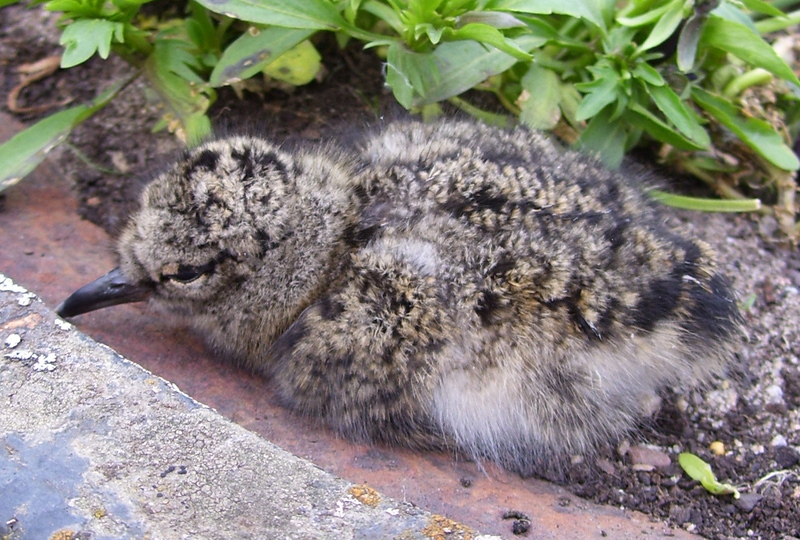 Sure enough, by Tuesday, one of the eggs had hatched: there, in amongst the pansies, huddled a damp and bedraggled handful of new-born oyster catcher. Its birth happened to coincide with our first guided tour party of the season, so it made a happy surprise for visitors who put their nose down to smell the pansies and found themselves face-to-face with a chick. The avian parents were remarkably unfazed by the influx of human visitors to their maternity suite. In fact, it has to be said that the current pair of garden oyster catchers are rather lacking in parenting skills; which just goes to show that a smart address is no guarantor of a good upbringing! Previous incumbents of the urns would dive-bomb anything or anyone loitering too close to their nest, but these two neglect it for hours at a time, pottering on the roof or in the fields quite oblivious to the beady eyes of hungry predators. Last year they lost both their summer broods to the crows and hawks. If anything, the humans were more upset by this than the oyster catchers: the gardeners and my family are all very fond of them. And sad to say, the two chicks who were hatched in the urn by yesterday evening, are this evening reduced to one. Isn’t the chick perfectly disguised against the soil? It does seem awful luck that its sibling has apparently been picked off after less than a day outside the egg. However, when I nipped into the garden to take this photo (don’t worry, I only stayed a few seconds, I didn’t go too close, and the parent was back with her chick less than five minutes later) the adults were more defensive than they have been in the past. 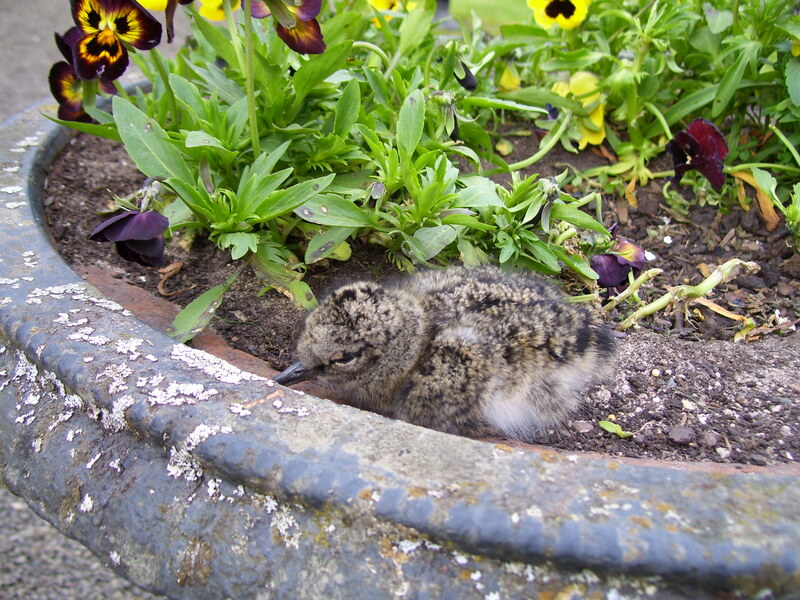 Perhaps they have got the idea at last: perhaps, perhaps, this little chick might have a future, and might one day be laying its own eggs in an urn in the walled garden. ← Seeing this, who could blame Eve? Oh how delightful! I am surrounded by oystercatchers (among other birds) and it amazes me there are so many as the birds seem to lay eggs in the least safest place. How come the little chicks don’t fall out of the urn?! Usually they nest on the ground – well around here they do. I do hope the poor wee only chick survives! Yes, they don’t seem to be too good at picking their nesting sites. 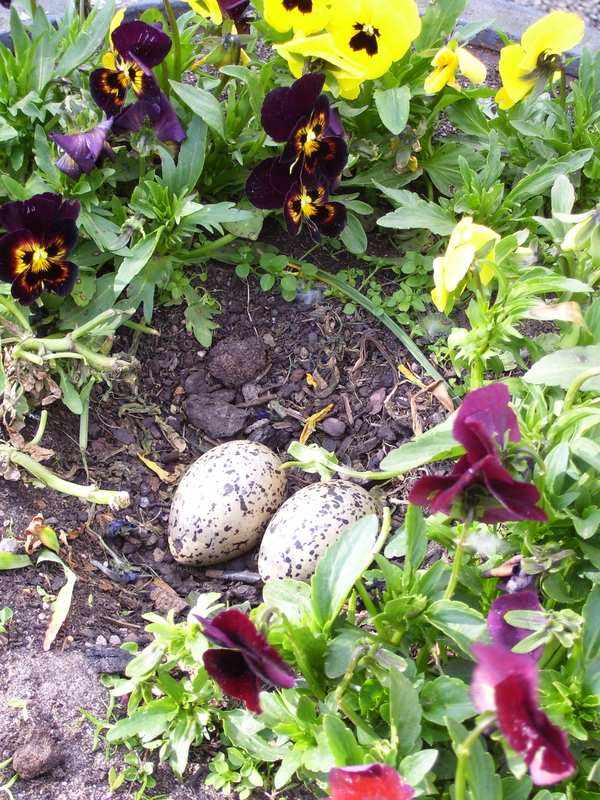 Apparently, Glamis Castle has a nesting pair too: they have laid two eggs in a scrape on the ground, actually on the path to the tea room, of all places! That little chick is so well camouflagued – what a pity one still was taken. Nature is just wonderful in design isn’t it (not the taking of the chick, just the patterns and the way things all work together). They nest they have chosen is certainly a scenic location! I hope the best for this chick! That it may fulfill it’s oyster catcher’s purpose in precious life! Very pretty eggs! We have a lot of oyster catchers round here too. The house martins are back and are busy repairing their mud nests.